To give you an overview of today's robotic exoskeletons, we compiled a catalogue with a selection of state of the art systems sorted by their main purpose and application. The selected systems should not be understood as an endorsement of a particular institution or manufacturer. They were simply chosen to show an interesting variety of existing exoskeletons. Please note that we are not responsible for the content of external websites. 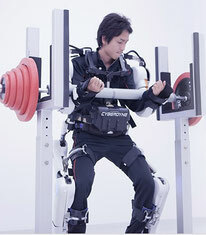 Exoskeletons for performance augmentation are mostly used by healthy users to enhance their perfomance, augment their strength or reduce exhaustment and fatigue during physically demanding tasks. These systems apply a supportive torque directly to the user's joint or relieve the user of the weight of a payload or the user's own body weight. 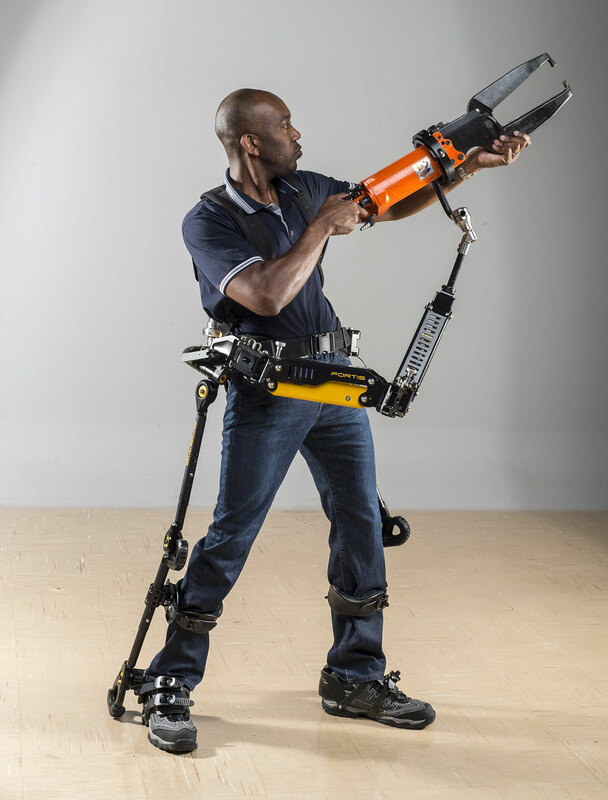 The Fortis exoskeleton is a passive lower limb device that enables the wearer to use heavy tools. The exoskeleton counterbalances the weight of the tool and transfers it to the ground to relieve the user. The HAL exoskeleton is available for a variety of applications, including a version for full body support. 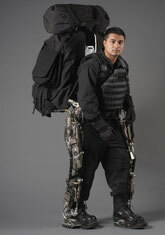 The company was among the first to develop robotic exoskeleton technology. The Berkeley Lower Extremity Exoskeleton (BLEEX) is a system for strength and endurance enhancement. The DARPA funded project started in 2000 with the goal to develop an exoskeleton that allows the user to carry a heavy load. Exoskeletons are used to restore lost motor funtionality after injury or desease. 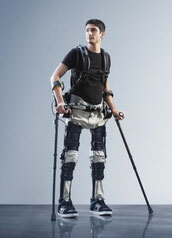 A typical application is the enablement paraplegic users to walk again with the help of the robotic exoskeleton. In such a case, the exoskeleton provides the power to move the legs while the user is triggering and controlling the exoskeleton movements. 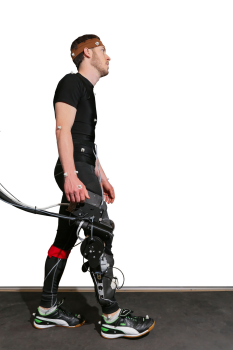 The ReWalk is a lower limb robotic exoskeleton that restores functional gait for spinal cord injured users with a complete loss of leg motor function. It is commercially available and has already CE and FDA approval. people with mobility disorders to be upright and mobile. It only has one actuator per leg in the hip joint to reduce weight and price. Phoenix is an investigational device that is not yet available commercially. 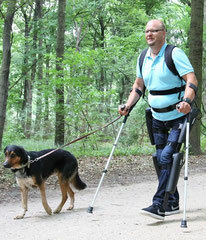 The Indego is a lower limb system that is based on an exoskeleton from the Vanderbildt University. It is commercially available for clinical and personal use. It comprises a modular design and can be disassembled for transportation. Rehabilitation exoskeletons are mostly used in a clinical setup where the are part of a broader rehabilitation program. Such systems a commonly used for stroke or spinal cord injured patient to facilitate recovery of lost motor functionality. The exoskeletons provide enough support to the patient to enable intensive training of gait or arm movements. 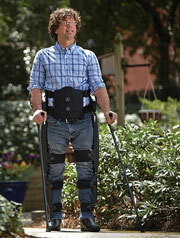 The lokomat is a gait rehabiliation exoskeletons that has been on the market since 2001. The LOPES (LOwer-extremity Powered ExoSkeleton) is a robotic device for gait training and assessment of motor function in stroke patients. 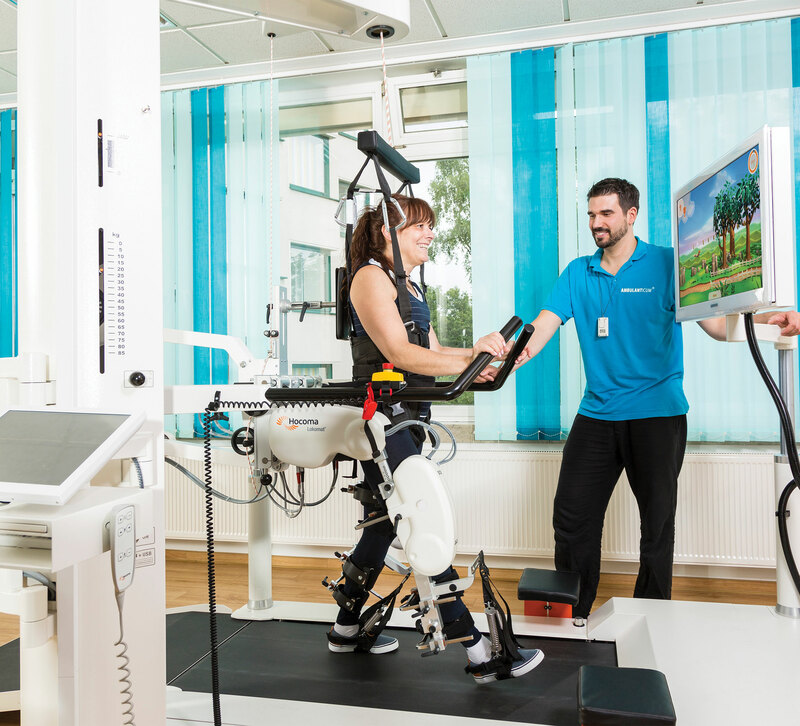 The Ekso GT is a rehabilitation device that enables overground gait training of stroke and spinal cord injury patients in rehabilitations centers workdwide. In addition to provide support to the user, experimental exoskeletons are also used to conduct investigations on the user within. A widely used approach to investigate any system (including the human) is to apply a perturbation and observe the reaction. As exoskeleton are physically interacting with the user, and can conviniently be equipped with a variety of sensors, they can be a very helpful tool for such experiments. Devices are used for example to investigate human motor learning or to identify physiological charachteristics, often with the goal to feed this knowledge back into the development of prosthesis and exoskeletons. This device was designed to biomechanically charachterize the human lower limb joints with the aim to use this knowledge to design better prostesic and orthotic devices. This exoskeleton was designed to investigate the mechanical properties of the human knee and ankle joint during specific gait phases. These properties are then intended to be used in the control of powered prostheses, robotic exoskeletons or other devices working in parallel with the human body. 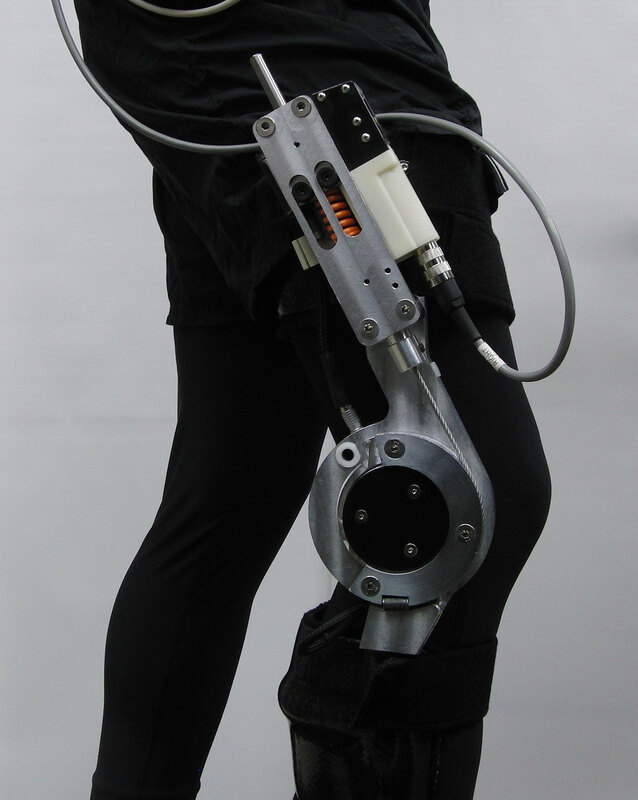 The Knee Perturbator is a robotic knee exoskeleton that was designed to impose perturbation on the user an measure the reaction to identify biomechanical human knee properties.